Researchers, academics and technical staff from around the world are equally concerned about millisecond timing accuracy in psychology experiments and often contact us with specific questions. By analyzing trends, we have put together this FAQ that should help answer many of your questions and allay any concerns you may have about any of our products. Why not scroll down to see some worked examples! If you have a question that isn't covered, or would like to know more about a specific area, feel free to email us at: info@blackboxtoolkit.com. What is the Black Box Toolkit v2 and why should I use it? What can I measure with the Black Box Toolkit v2? How common are conditional biases that affect presentation and response timing? Why do I need to check every paradigm? Can't I just benchmark the PC, Mac or Linux system the experiment is running on? Which academic journals are requesting that authors validate their timings? How can your software/Black Box ToolKit v2 get accurate timings when my experiment generator can't? Can I test the timing of my Mac or Linux based experiment? What about other platforms or equipment like MRI, EEG and eye trackers? What's do the terms Host and Remote mean? How do I check whether visual and auditory stimuli are synchronized? How do I use the BBTK v2 Robotic Key Actuator to press keys on a laptop or response pad to check response timing? How do I use the BBTK v2 Robotic Key Actuator to make responses on an iPad, Android tablet or other touch screen device? How do I test the response latency of voice keys? How can I use video clips and obtain accurate timing? How do I check the timing accuracy of a visual priming or RSVP study? How can I use the BBTK v2 to check AOA timings with an eye tracker? How do I event mark stimulus or response activity on an EEG trace? How do I event mark complex stimulus, synchronization or response activity on an EEG trace? How do I use a MRI synchronization trigger pulse or reference signal in fMRI? My chosen response device is adding to response timing. What should I do? How do I plot the absolute error and variability of my response device? I've found an error in the synchrony between my visual or auditory stimuli. How do I correct this? There is a synchronization error between my experiment and third party equipment (EEG, MEG, fMRI, eye tracker). How do I correct this? Should I look at whole system timing to improve my accuracy? What's the most accurate experiment generator for presentation and response timing? Which brand/model or computer is the most accurate? What's best for visual presentation: a CRT, TFT or data projector? What's the best response device? I can connect my response device by either USB or serial. What interface is best? Soundcards... Which one should I buy? Are faster multi-core processors better than slower ones? *What does the term "Curate's Egg" mean? How does the BBTK v2 connect to the host PC? Will your BBTK v2 work in our MRI scanner room? Is there a Mac/Linux version of the software? Is there an API? We've built some custom response equipment. How do we link to the TTL interfaces offered by the BBTK v2? How many screen regions can I monitor at once? How do I adjust the sensitivity of the BBTK v2 sensors? Can I use the BBTK v2 with third party experiment generators or software I wrote myself? How do I link the BBTK v2 up to my MRI scanner sync pulse so that I can relate presentations to actual acquisitions? Can I use the BBTK v2 like a traditional digital oscilloscope? Can I use the BBTK v2 like a traditional pulse/function generator? Can I do what the Black Box ToolKit v2 does with a digital oscilloscope and signal generator? What's the typical sampling rate of the Black Box Toolkit v2? Our department would like you to come and give a talk. Would you be willing to do this? What about training? We'd like to integrate some best practice guidance into the way we teach undergraduates in the use of experiment generators. Could you advise us? Our study is time critical and we need to have validated results together with independent timing certification. Do you offer a consultancy service? Do you offer multi-pack discounts? The Black Box ToolKit v2 is a device that lets you quickly and easily check your own millisecond timing accuracy in terms of stimulus presentation accuracy; stimulus synchronization accuracy; and response time accuracy. Researchers within the behavioral sciences regularly make use of computer-based paradigms. Most assume that the computer accurately presents stimulus materials and records responses as programmed. However research has shown this expectation is often misplaced. Presentation, synchronization and response timing errors can be caused by many factors. Whether you make use of a commercial experiment generator or write custom software, you are likely to succumb to such errors. Inconsistent timing can lead to spurious conditional effects, poor replicability and bad science. The ToolKit has been specifically developed to help researchers address timing issues related to their own paradigms running on their own hardware. The BBTK v2 operates as a virtual human programmed to respond to stimulus presentations and generate appropriate responses very accurately. It can step through your whole experiment as if it was a human participant. Typically external sensors are hooked up to a second PC, Mac or Linux box to detect stimulus presentations. An output interface is used to feed a response into the paradigm under test. The BBTK v2 measures the timing of all stimulus, synchronization and response events extremely accurately, allowing the researcher to compare timing measured by their own equipment with the actual real world timings. The BBTK v2 can also work with up to 20 I/O TTL lines when used in fMRI studies, for EEG event marking/triggering or eye tracking. The Black Box ToolKit v2 offers various sensors that can be attached externally to a second computer system running an experiment. These sensors detect when a visual stimulus is displayed, audio is played, a TTL signal or TTL trigger is received, or when a human presses a remote response button. All testing can be done without modifying your experiment, in situ, on your own equipment by virtue of the use of external sensors. Three versions of the BBTK v2 are available: Entry (12 channel), Pro (20 channel) and Elite (36 channel). They differ in the number of channels available and the number of sensors supplied is specific to the package purchased. TTL input: Up to 10 TTL input channels/TTL triggers allow you to time TTL signals sent from external equipment, e.g. fMRI, EEG, eye trackers etc. Robotic Response Key Actuator: The RKA can press keys on your own response devices, e.g. laptop keys, response pads, Android tablets, iPads, touch screen phones etc. The BBTK v2 can be used to test the timing of virtually any experimental paradigm by acting as a highly accurate virtual human pre-programmed to respond to stimuli and automatically step through your experiment. The exact timing of any event, on any sensor or response channel, is logged with sub-millisecond accuracy enabling you to quickly determine real world accuracy. Unfortunately they have existed in every paradigm we have looked at regardless of platform, operating system, or whether a commercial experiment generator has been used or not. In all cases the researcher has been unaware of the magnitude of presentation, synchronization, or response biases. More worryingly on many occasions there has been a conditional bias caused by the equipment itself. For example in cross modal studies it is common for trials where audio is present to have markedly different response timing characteristics. This can account for apparently statistically significant experimental results that lead to spurious conclusions. The latest research also suggests that human participants are actually much faster processors of information than previously thought. In the case of vision Thurgood, Whitfield & Patterson, 2011, showed that humans could recognize the outlines of animals with 83% accuracy at exposure times of just one millisecond when using specialist presentation devices. This makes accurate presentation, synchronization and response timing even more critical. Currently most journals are not requesting that authors formally specify that they have tested the timing characteristics of their study. However this will be changing in the near future with many journals setting the trend by requesting that authors submit their software, scripts and data for inclusion within a repository. The current focus on replication across the field is testament to the fact that journal editors and reviewers are tightening their criteria for publication. Whilst we accept that academics follow best endeavors, on many occasions it is useful to know the timing limits on a given study and how the author verified timing accuracy. How can your Black Box ToolKit v2obtain accurate timings when my experiment generator can't? The Black Box ToolKit v2 is based around a 32 bit ARM CPU, like the one in most iPhones and Android handsets and has 2 MB of onboard RAM for storing its firmware and settings and 8 MB of RAM for storing timing data. What do the terms Host and Remote mean? The term Host is used to refer to the Microsoft Windows based PC that has the Black Box ToolKit v2 physically plugged into its USB port and runs our PC Software (XP, Windows 7 or Windows 8). This PC controls the BBTK and analyses data. It could be a PC desktop, laptop or netbook. By using VMWare, Parallels, VirtualBox or Boot Camp this also lets you control the BBTK from other platforms. 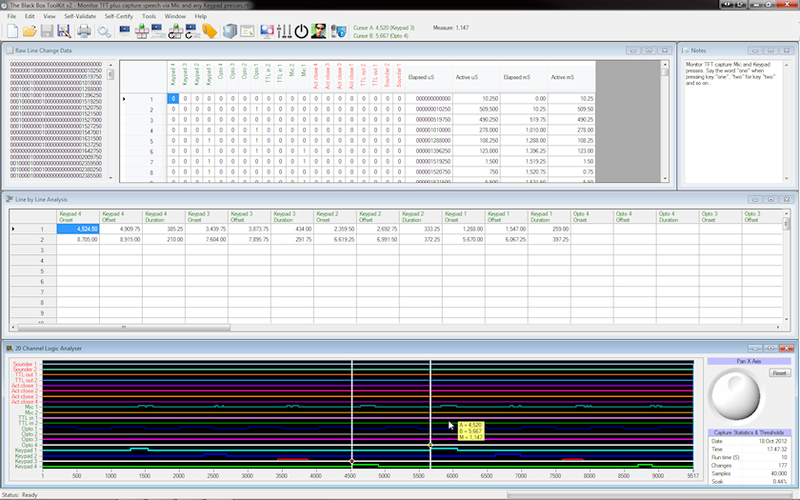 In addition by using the BBTK v2 API you can also control and analyze data using your own custom written software, e.g. MATLAB, PsychoPy etc. To check the synchrony of visual and auditory stimuli you would attach one or more opto-detectors to your remote screen, i.e. the computer running the experiment (shown in grey below). Then place one or more BBTK v2 microphones next to your remote speakers (green). To provide a baseline you could also attach a TTL lead from the parallel port of your remote PC to the BBTK v2 breakout board (yellow). If your PC does not have a parallel port you could use a BBTK USB TTL event marking module instead. To utilize this TTL synch signal you would program your experiment generator script to output a TTL signal at the onset of the presentation of the visual stimulus. An Active Switch Closure (ASC) lead could be wired from the breakout board of the BBTK (light blue) to the left mouse button of your remote PC (red) so as to trigger a response when each stimulus image is detected. The collection of timing data and generation of responses is controlled by a second host PC/Laptop/Netbook that is connected to the BBTK via USB (blue). The Digital Stimulus Capture And Response (DSCAR) module of the BBTKv2 PC Software would be run from this second host PC in order to detect visual stimuli and make responses. In this example DSCAR has been instructed to respond after 300mS by pressing the left mouse button using an ASC lead (red). Once the BBTK has automatically stepped through your whole experiment, timing data will be presented for analysis. One spreadsheet view displays raw timing data whilst a second displays changes across up to 36 channels, e.g. visual stimulus onset, offset and duration in milliseconds. A graphical 20 Channel Logic Analyzer enables you to compare the timings of any events by means of two draggable measurement cursors. In this example we can see that the TTL signal from the remote PC running the experiment appears on TTL in 1 before the onset of the visual stimuli on Opto 1. The onset of both should be synchronized and any difference between the two is likely to be due to the input lag of the display device. That is, the inherent delay between requesting an image be displayed and when it physically appears. This delay is usually caused by the display devices electronics and any image processing. On the same trace we can see that the two mics detected the leading edge of a stereo tone later than the onset of the visual presentation. Such delays can be caused by sound card startup latency where the intended tone appears at the speakers much later than requested due to the sound cards electronics. Act close 1 shows when the BBTK v2 generated a response relative to the onset of the visual stimulus image. In this case a yellow tooltip shows that the true RT is 300 ms. The Robotic Key Actuator (RKA) is designed to press a key on a response device without having to dismantle it to physically wire an Active Switch Closure (ASC) lead from the BBTK v2. Once calibrated the RKA is consistent to around 1-2 ms when pressing keys. The RKA has an adjustable plunger that can be moved either horizontally or vertically to enable perfect positioning and a foam pad to provide cushioning for your response device. In the example shown the RKA is pressing the space bar on a Netbook keyboard in response to a visual stimulus detected on an opto-detector (shown in grey below). The RKA is controlled via a special trigger lead (black) from the breakout board and is activated by a TTL Out 1 signal from the BBTK v2 that tells it when to press and for how long. To provide a baseline you could also attach a TTL lead from the parallel port of the remote laptop/PC to the BBTK breakout board (yellow). If your PC does not have a parallel port you could use a BBTK USB TTL event marking module instead. To utilize the TTL synch signal wire you would program your experiment generator script to output a TTL signal at the onset of the presentation of a visual stimulus. The breakout board itself is connected to the BBTK via a 25-way cable (light blue). In addition to being able to press keys on your own response devices the Robotic Key Actuator (RKA) can also make responses on capacitive touch screen hardware. This is accomplished using a piece of high density electroconductive foam which is grounded to the breakout board (shown in green below). Once calibrated and a small air gap set, the RKA is consistent to around 1-2 ms when registering touches and releases. The RKA has an adjustable plunger which can be moved either horizontally or vertically to enable perfect positioning. The electroconductive foam pad also provides cushioning for your touch screen device. In the example shown the RKA is touching the screen in response to a visual stimulus detected on an opto-detector (grey). The RKA is controlled by a special trigger lead (black) from the breakout board and is activated by a TTL Out 1 signal from the BBTK v2 that tells it when to press and for how long. The breakout board itself is connected to the BBTK v2 via a 25 way cable (light blue). One of the few reliable ways to test the response latency of a voice key is to use a TTL signal/TTL trigger from an experiment generator to indicate when it is ready to accept a response and then to generate an independent tone using a sounder. In the example shown below a TTL signal could be sent from the experiment generator into TTL In 1 (shown in yellow below) of the BBTK v2 via the breakout board. Using Digital Stimulus Capture And Response (DSCAR) you could construct a sequence that triggered on every TTL In 1 signal and in response generated a tone after 300 ms using a BBTK v2 Sounder (orange). This tone should trigger the experiment generators voice key (black) and register a RT of 300 ms should everything be working correctly. Any deviation from the intended true RT of 300 ms is likely to be due to the latency of the voice key hardware and detection routine within the experiment generator software. The collection of timing data and generation of responses is controlled by a second host PC/Laptop/Netbook that is connected to the BBTK v2 via USB (blue). Once the BBTK v2 has automatically stepped through your whole experiment, timing data would be presented for analysis. 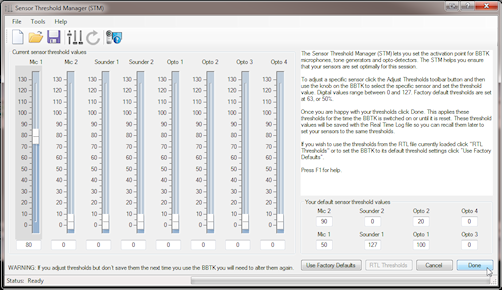 To check timings you would use the 20 Channel Logic Analyzer to confirm that each tone was generated on Sounder 1 300 ms after the onset of the TTL in 1 signal/TTL trigger from the experiment generator as shown below. Traditionally experiment generators are extremely poor at timing when a video stimulus is playing. Using the BBTK response pad together with our Digital Stimulus Capture (DSC) software can help you obtain sub-millisecond accurate presentation and response timings. In this scenario the experiment generator is only presenting the video and all timing duties are taken over by the BBTK. To achieve this level of accuracy you would use a video editor to superimpose a white 32x32 pixel event marker block at the start of each scene you were interested in. Other frames should have a black block at the same position so that they don't activate the BBTK opto-detector. Typically event markers are placed at the bottom corner of a video so that the opto-detector can be covered up by a custom made secondary frame obscuring the bottom 32 pixels of the monitor. In the example shown below an opto-detector is attached to the screen to detect the event marker (shown in grey below). To provide a baseline you could also attach a TTL lead from the parallel port of the remote laptop/PC to the BBTK breakout board (yellow). If your PC does not have a parallel port you could use a BBTK USB TTL event marking module instead. To utilize this TTL synch signal wire you would program your experiment generator script to output a TTL signal/TTL trigger at the onset of the presentation of a visual stimulus. The breakout board itself is connected to the BBTK v2 via a 25-way cable (light blue). Two BBTK mics could be placed next to your speakers to timestamp any audio (green). Finally to accept responses a 4 button BBTK response pad is connected to the main unit (black) and an Active Switch Closure (ASC) lead tacked to your own response device button (red). When a key is pressed on the BBTK response pad your own response device would be simultaneously triggered as though a button on it had been pressed. When your experiment was complete you would use the 20 Channel Logic Analyzer to check for the occurrence of the white event marker on the scenes you were interested in (Opto 1). You could then use the cursors to measure the RT between the appearance of the reference block and a response button being pressed on Keypad 1 (300mS in this example). Any sounds played by the video would be shown on Mics 1 and 2. If you wanted to check for TFT monitor input lag, or the lag between when the experiment generator thought it had correctly event marked the desired frames, you would check the sync of the TTL signal/TTL trigger sent to the BBTK v2 relative to those events (TTL in 1). For example, by subtracting the image onset from the TTL signal this gives a measure of the input lag and the inherent delay in your equipment and experiment generator. Because your own response device would be triggered when you press a response key on the BBTK keypad (red) you could compare what your experiment generator recorded against the true RT recorded by the BBTK v2 to calculate response timing error. For priming or RSVP studies you may wish to make use of multiple white opto-detector markers (up to 4 on the Pro and Elite models) so that you can detect each fixation, prime, mask and so on. If you don't want to activate an opto on a particular prime or mask you will need to have black event markers at all other opto locations as shown below. In this example opto 1 might be located to bottom left of your remote screen (fixation), opto 2 bottom right (mask), opto 3 top right (prime), opto 4 top left (mask). Where no optos should be triggered a black marker should be displayed. Typically this will be where the background is pure black and no event markers are displayed. By using all four optos you can monitor for the onset, duration and offset of each visual event on fixation frames, primes and masks. How do I use the BBTK v2 to check AOA timings with an eye tracker? The BBTK v2 has up to 20 TTL input and output channels or triggers that can be used to event mark stimuli, capture synchronization signals and record responses when performing eye tracking. This lets you check whether stimulus presentations and responses are temporally yoked to TTL AOA markers from your eye tracker – you can compare the events your experiment generator, or eye tracking hardware and software, timed against the true event timings measured by the BBTK v2. In the simple eye tracking scenario shown an experiment generator is presenting an image and playing a tone through a set of speakers. To check timing accuracy an opto-detector (shown in grey below) could be positioned on the remote screen so as to detect the onset and duration of each visual presentation. To record the timings of audio presentations one or more BBTK v2 microphones could be placed next to the remote speakers (green). An AOA signal, or event marker, from your eye tracker could be fed into TTL In 1 of the BBTK v2 breakout board (yellow) in order to provide a gaze dependent reference. A second TTL trigger from your experiment generator could be connected to TTL In 2 (yellow). To utilize this second TTL signal you would program your experiment generator to output a TTL signal at the onset of each visual presentation. This would enable you to check the level of lag inherent in the display device and eye tracker being used. A third TTL signal (black) could be fed back into the eye tracking hardware from the BBTK v2 to act as an external event marker, e.g. to indicate when the speakers were producing sound. An Active Switch Closure (ASC) lead could be wired from the breakout board of the BBTK v2 to the left button of the remote mouse (red) so as to trigger a response with a known RT when each stimulus image is detected, e.g. 300 ms. The breakout board itself is connected to the BBTK v2 via a 25 way cable (light blue). The BBTK v2 has up to 10 TTL output channels/TTL triggers which can be used to event mark stimuli, synchronization triggers and responses on an EEG trace. For example, when a stimulus or patterns of stimuli are detected, a TTL event marker can be generated on any given channel. If the BBTK v2 is making a response with a known RT, a temporally yoked TTL marker can be generated to signify the onset of that event. This lets you compare the events your experiment generator, or EEG hardware and software, timed against the true event timings recorded by the BBTK v2. In the simple EEG scenario shown an experiment generator is presenting an image and playing a tone through the left or right speaker. To check the synchrony of a visual and auditory stimulus you could attach one or more opto-detectors to the remote screen (shown in grey below). Then place one or more BBTK microphones next to the remote speakers (green). To provide a baseline you could also attach a TTL lead from the parallel port of the remote PC to the BBTK v2 breakout board (yellow). If your PC does not have a parallel port you could use a BBTK USB TTL event marking module instead. To utilize this TTL synch signal wire you would program your experiment generator to output a TTL signal/TTL trigger at the onset of the presentation of the visual stimulus. An Active Switch Closure (ASC) lead could be wired to the breakout board of the BBTK (light blue) and then to the left mouse button of the remote PC (red) so as to make a response when each stimulus image is detected. When the BBTK v2 physically detects a visual stimulus it could feed a TTL signal/event marker (black) into your EEG amplifier so as to mark the true onset. Alternatively when the BBTK v2 generated a response with a known RT by closing the switch on your mouse via an ASC lead, a simultaneous TTL marker/TTL trigger could be generated. How can I use the BBTK v2 to event mark complex stimulus or response activity on an EEG trace? The BBTK v2 has up to 10 TTL output channels/TTL triggers which can be used to event mark stimuli, synchronization triggers and responses on an EEG trace. For example, when a stimulus or patterns of stimuli are detected, TTL event markers can be generated on specific channels tied to the stimulus location or type of stimulus. If the BBTK v2 is making a response with a known RT, a temporally yoked TTL marker/TTL trigger can be generated to signify the onset and duration of that event. This lets you compare the events your experiment generator, or EEG hardware and software, timed against the true event timings measured by the BBTK v2. In the more complex EEG scenario shown an experiment generator is presenting a series of images and playing a tone through the left or right speaker. For example, four opto-detectors (shown in grey below) could be positioned on the remote screen so as to detect the onset and duration of four continuous frames in a priming study. At each position black/white markers would indicate the fixation frame, the mask, the prime and the backward mask. When each frame was detected by the BBTK v2 it would event mark each onset/duration on four separate TTL Out lines (black) which would be fed back into your EEG amplifier so as to mark the true onset/duration on one of four channels. In this case the four additional TTL lines/TTL triggers are provided by the 16 channel TTL expansion module connected to the BBTK v2 (light blue). To time audio presentations you would place one or more BBTK v2 microphones next to the remote speakers (green). To provide a baseline you could also attach a TTL lead from the parallel port of the remote PC to the BBTK v2 breakout board (yellow). If your PC does not have a parallel port you could use a BBTK USB TTL event marking module instead. To utilize this TTL synch signal wire you would program your experiment generator to output a signal at the onset of each visual presentation. A second TTL line (yellow) would normally be connected from your presentation PC to your EEG amplifier/second PC. Depending on your exact configuration it may be possible to tap into this TTL line and simultaneously feed that into the BBTK v2 breakout board rather than connect up a second line. An Active Switch Closure (ASC) lead could be wired from the breakout board of the BBTK v2 (light blue) to the left mouse button of the remote PC (red) so as to make a response when each stimulus image is detected. When the BBTK v2 generates a response at a known RT by closing the switch on your mouse via an ASC lead, a simultaneous TTL Out (black) marker could be sent. This would give a total of five independent TTL event marking channels/TTL triggers which covered all visual stimuli and each response. If required it would be possible to add more TTL event marking lines/TTL triggers to mark events on other EEG channels, e.g. to mark true left and right tone onset and duration. The BBTK v2 has up to 20 TTL input and output channels/TTL triggers, which can be used to event mark stimuli, capture scanner sync pulses and record responses when performing fMRI. This lets you check whether stimulus presentations, synchronization triggers and responses are temporally yoked to the TTL sync pulse from the scanner – you can compare the events your experiment generator, or MRI hardware and software, timed against the true event timings measured by the BBTK v2. In the simple MRI scenario shown an experiment generator is presenting an image via a data projector positioned outside the scanner room and playing a tone through a set of pneumatic headphones. To check timing accuracy an opto-detector (shown in grey below) would be positioned on the remote screen so as to detect the onset and duration of each visual presentation. To record the timings of audio presentations one or more BBTK v2 microphones would be placed next to the remote headphones (green). To register responses with a known RT an Active Switch Closure (ASC) lead could be wired from the breakout board of the BBTK v2 (light blue) to a button of the remote MRI response pad (red) so as to trigger a response when each stimulus image is detected. The scanner sync pulse would normally be fed into TTL In 1 of the BBTK v2 breakout board (yellow) to provide a reference signal. A second TTL line from your experiment generator could be connected to TTL In 2. To utilize this second TTL signal/TTL trigger wire you would program your experiment generator to output a signal at the onset of the presentation of the visual stimulus. This would enable you to check for the level of input lag inherent in the data projector being used or any synchronization issues. All connections should be made outside of the scanner room via a patch panel as currently we do not advise, nor endorse, the use of any BBTK v2 sensors or other equipment inside the scanner room. No part of the BBTK v2 should be considered scanner safe. The first thing to do is establish the contribution the device is adding using a BBTK v2. Once this has been established you need to determine its variability and decide whether this is acceptable within your current study. If the absolute error is consistent and variability low it may be possible to subtract the error post hoc so that RTs more closely reflect what the true RT would have been. One could measure this by telling your experiment generator to output a TTL signal/TTL trigger when presenting a stimulus. This could be used as a trigger by the BBTK v2 that would then generate a response with a known RT that could be fed into your own response device via an Active Switch Closure (ASC) lead. Alternatively the BBTK v2 Robotic Key Actuator (RKA) could be used to respond on your own response device. Detecting stimuli and responding with a known RT would be controlled by the Digital Stimulus Capture And Response (DSCAR) module of the BBTK v2 PC software. If a TTL output/TTL trigger cannot be made by the computer you are using to run the experiment you would need to examine whole system timing. To improve whole system timing accuracy you would make alterations to your experiment which tightened presentation, synchronization and response timing, e.g. by moving a visual presentation back in time to realign it with an audio stimulus. You should bear in mind the absolute error of a response device may also affect when a stimulus presentation is terminated and the next presentation made. It could also affect synchronization between other hardware you may be using, e.g. EEG, fMRI, eye trackers etc. Depending on whether you used Digital Stimulus Capture And Response (DSCAR) to generate responses, or the BBTK response pad to actively trigger your own response device, the analysis method will vary. If you used DSCAR you will have entered a fixed delay, i.e. RT, which will have elapsed before a response was made. This is a known delay and should match the response time recorded by the experiment on the remote computer if there is zero error. 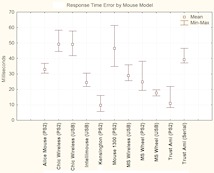 To calculate the absolute error, response times from your experiment can be pasted into Microsoft Excel and subtracted from the true response time. Variability in the response device can be ascertained using standard statistical functions such as STDEV etc. Typically you will need to retest the paradigm using a BBTK v2 after making incremental corrections to the stimulus onset times or durations. For visual stimuli this may mean that you need to move a presentation forward along the timeline and start accepting responses earlier. If images are presented for longer than expected you may also need to alter durations. Such corrections may also involve various manipulations specific to the software you are using, e.g. in E-Prime you may need to cache images using the canvas object or alter the timing mode etc. At the most extreme it could mean using another display device. Alternatively you could also manipulate the stimulus materials themselves. For example if a tone is played for longer than expected you could use a sound editor to shorten the duration so that it matched that intended when presented by the experiment generator. Another example is where you may need to insert silence into a sound files beginning to ensure that the actual sound is produced at the speakers at exactly the same point as a visual stimulus is presented. There is a synchronisation error between my experiment and third party equipment (EEG, MEG, fMRI, eye tracker). How do I correct this? If you are presenting stimuli based on a TTL sync signal/TTL trigger from third party equipment such as EEG, MEG, fMRI, eye tracker etc, it may be that your experiment generator reacts to it later than intended. For example, TFT input lag may mean that a stimulus image is displayed 50 ms later than the sync signal is sent. Through previous testing you may have established that the input lag of your particular TFT monitor is 30 ms. In this case the additional 20 ms would be likely to be caused by delays within the experiment generator and/or computer system. To correct the late display relative to the sync signal you would need to move the signal forward by 50 ms in time so that the visual presentation was correctly aligned in the real world. Typically this would need to be done in the equipment generating the sync signal. On some occasions the 50 ms delay may still exist, but simply be timeshifted forward by 50 ms.
To correct a timeshifted delay you may need to send two TTL sync signals/TTL triggers from your equipment where the first is a "dummy signal" that is used to trigger the experiment generator to display the image and the second is the real sync signal, i.e. 50 ms later to correct for the error described above. You would need to program your experiment generator to display the image on the first and time RTs from the second signal. This would temporally align the display of the image with the "real" sync signal, i.e. the second one. The short answer is yes! Whole system timing is where you consider the timing accuracy of everything as a cohesive unit. By "system" we mean your computer and operating system, your presentation devices, response devices and any other third party hardware you interact with, e.g. EEG, MEG, fMRI, eye trackers etc. This means that you need to use a BBTK v2 to evaluate every aspect of your timing, i.e. presentation, synchronisation and response. Once you have a set of baseline timings you should then make small incremental changes that lead to improvements in accuracy when measured empirically with a BBTK. This may on occasion mean that you need to make adjustments that at first seem counterintuitive. For example, by reducing the length of a sound file so that it plays for the correct duration on your specific sound card, amplifier and speakers, or by playing it earlier to realign it with a visual stimulus. Depending on the context you wish to use the display device in and the paradigm in question, the balance varies. For example, for RSVP and priming or experiments where synchronisation is important, the only realistic option remains a CRT. In general data projectors have the worst input lag, with TFTs somewhere in the middle. Input lag means that images are not displayed when requested as the display devices electronics takes time to process the image and physically display it. Unfortunately an experiment generator only knows about the time it requested the image be displayed and not when it physically appeared on-screen. Depending on the experiment you are running you may be limited in your choice of response device. Ideally you should use a recognized manufacturers response box, or pad like those available from ourselves, as this is likely to have a small internal delay that contributes relatively little to response time error. However, it is worth bearing in mind some computer mice can have an equal, or better variability, as compared with some experiment generator vendors own devices. Combined with a small absolute error such mice can offer a viable alternative, which can cost many hundreds of times less in some cases. Typically much of the inaccuracy response devices contribute to RTs is due to inherent delays within the hardware itself. For example a typical keyboard can add approximately 30~70ms to the true RT. Much of this variability is due to a scanning, or polling loop, where key states are checked and then reported to the computer. Any response device which has buttons, or keys, that need to be checked or its position monitored, e.g. a computer mouse, will most likely make use of polling loops and have an inbuilt level of absolute error and variability. I can connect my response device by either USB, PS/2 or serial. What interface is best? All soundcards are susceptible to soundcard startup latency. This is the time it takes a sound to physically emerge at the speakers versus the time the computer requests the sound be played. Generally more expensive soundcards have lower startup latencies as compared with those that are integrated within a computers motherboard, e.g. AC97 or Intel High Definition Audio (also called HD Audio or Azalia). Typically cards that offer ASIO drivers have better quality hardware and drivers and therefore tend to have lower startup latencies. To be certain of the contribution your soundcard is making to audio presentation delays you will need to check startup latencies using a Black Box ToolKit v2. Typically all cards that support Microsoft DirectX should be capable of very fast display/buffering times. However you should bear in mind that some drivers are better than others. Once you have checked a paradigm with the Black Box Toolkit v2 you are advised not to update any system drivers without retesting. In addition some drivers offer advanced options such as tick boxes that allow you to sync the card with the refresh signal, e.g. ATI's Catalyst drivers. Various settings can alter display performance and should be checked if you have problems. You are advised to consult various gaming websites as again display performance is crucial for gamers. Not necessarily as there are no guarantees that a faster system doesn't have other "issues" that prevent accurate timing. For example drivers, add-in cards, installed software, background tasks and the like will have an affect on your ability to obtain millisecond accurate presentation, synchronisation and response timings. Computers that have a faster GHz rating don't necessarily have more accurate clocks. To find out more about clock drift Google "PC clock drift". Some PCs' clocks can gain over 10 minutes per day whilst others loose time. This is due to the quality of the crystal oscillator on the motherboard and it is this that provides a base for all millisecond timing. A curate is a term used in various Christian religions who possess an ordained ministry to describe a priest who is not a parish priest but operates in effect as his or her deputy. Some larger parishes may have more than one curate. Most curates are eventually raised to become a parish priest in another parish as the older priests retire or die. How does the Black Box ToolKit v2 connect to the host PC? What's the difference between Passive and Active Switch Closure? Passive Switch Closure is where a flying lead from your response device switch is fed into the BBTKv2 . So when you press a button on your response device its timing characteristics are also recorded by the BBTK v2 at the same time as your own experiment (response onset and duration are recorded). When using the opto-detectors you are advised to work in a room illuminated by natural lighting. Artificial fluorescent lighting for example can inadvertently activate the sensitive opto-detectors. Typically this will appear as mains frequency hum when you analyse your data (regular spaced peaks at 50/60Hz). Will your kit work in our MRI scanner room? Currently no parts of the BBTK v2, or any other of our products (unless specifically marked), should be considered scanner safe. To utilise the BBTK v2 you are advised to make use of a patch panel and tap into sync signals/TTL triggers, video I/O, audio, responses etc. from there. Is there a Mac version of the software? Is there an API? Currently we only supply our BBTK v2 control and analysis software as a Microsoft Windows application. However, you can use the BBTK v2 API to control and analyse data using any platform that supports the standard ASCII/text protocol over serial. The BBTK v2 is physically connected by USB but is accessed via a virtualised serial COM port. This means that you can control the BBTK v2 from MATLAB, PsychoPy or any other software, or platform, that supports a COM port, e.g. Mac, Linux etc. We've built some custom response equipment. How do we link to the TTL interfaces/TTL triggers offered by the BBTK v2? To make use of the BBTK v2 TTL I/O interface you need to be able to generate TTL signals/TTL triggers that present 0V to 3~5V signals. Where the change from 0 to 3~5V indicates a change in activity, e.g. MRI scanner sync pulse, visual stimulus image onset etc. In addition the BBTK v2 can generate TTL signals/TTL triggers in order to event mark activity or stimuli onset, e.g. conditional EEG event marking, simultaneous TTL signal with a response action such as an Active Switch Closure (where a response key is closed on your own device). The Entry level BBTK v2 can make use of a maximum of two opto-detectors, and the Pro and Elite four. By default they ship with one, two and four opto-detectors respectively. Opto-detectors can be used with TFTs, CRTs, data projectors or any other device that switches between no, or little light/black, and bright light, i.e. black and white event markers. 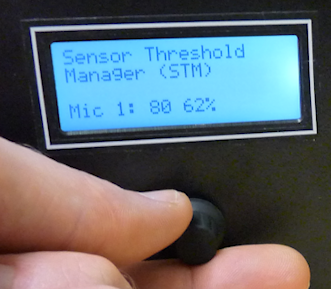 How do I adjust the sensitivity of the Black Box ToolKits v2 sensors? The sensitivity of the BBTK v2 sensors, e.g. opto-detectors, mics etc. are digitally adjusted and range between 0~127. In general they should be adjusted in line with the performance characteristics of a human. Simply, place the sensors where you'd expect a human to be looking or listening. Then using the Sensor Threshold Manager (STM) to adjust the sensitivity via the rotary encoder (turn and push knob) on the front panel of the BBTK v2 until the activity lights illuminate and dim when the stimulus is removed. As threshold values change a digital value will be simultaneously displayed on the BBTK v2 LCD and in our PC software. Can I use the kit with third party experiment generators or software I wrote myself? Yes. You can use the BBTK v2 API to control and analyze data using any platform that supports the standard ASCII/text protocol over serial. The BBTK v2 is physically connected by USB but is accessed via a virtualised serial COM port. This means that you can control the BBTK v2 from MATLAB, PsychoPy or any other software, or platform, that supports a COM port, e.g. Mac, Linux etc. The kit provides up to 10 TTL input lines (3.3~5V). Any of these can be used to track the scanner sync pulse. You are advised to alter your scanner sync pulse characteristics so that it is long enough to be detected by the BBTK v2 and easily seen by you within a timing validation run, e.g. 10-20 ms width, high active. When you assess the timing accuracy of your experiment you will also capture the scanner sync pulse as well as visual and auditory presentations and subsequent responses. In the 20 channel logic analyzer you will be able to see the relationship between the scanner sync pulse, visual and auditory presentations and any responses. With this additional data you should be able to correlate brain activity on any given acquisition with a specific presentation and subsequent response data. 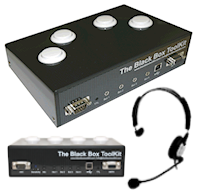 Can I use the Black Box ToolKit v2 like a traditional digital oscilloscope? No. The BBTK v2 only supports binary states on each input and output line, either on or off, TTL +3~5V and 0V, or switch closure active or not active. Can I use the Black Box ToolKit v2 like a traditional pulse/function generator? Yes. However the BBTK v2 only supports binary states on each output line as a square wave, TTL +3~5V and 0V, or switch closure active or not active. Whereas traditional function generators let you create different forms of waves and also vary the voltage. The BBTK v2 enables you to create an infinite number of regular square wave TTL events across up to 36 channels. No. In effect you would need a 20 channel digital oscilloscope/logic analyzer to monitor inputs and a 16 channel function generator to generate responses. This type of setup would be prohibitively expensive and would mean that several devices would need to be daisy chained together to achieve the same number of channels. 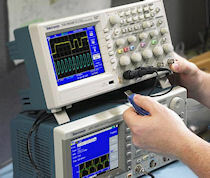 In addition making the oscilloscope/logic analyzer talk to the function generator on an event-by-event basis would be extremely difficult, if not impossible, as such equipment is not designed to work in this way. Remember the BBTK v2 can respond on an event-by-event basis to stimuli and generate patterns of responses as if it were a human participant. 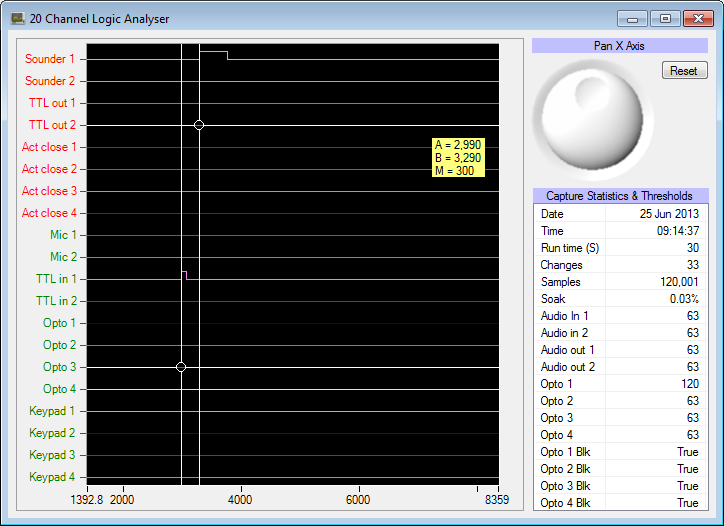 All parameters can be set quickly and easily and results are displayed graphically in 20 channel logic analyzer. Each event onset, offset and duration is simultaneously displayed in spreadsheet windows for rapid analysis. When compared to bench equipment the kit samples at relatively low rates. Although the ARM chip in the BBTK v2 runs with a clock speed of 96 MHz (96 million instructions per second) we have chosen to downsample to 6 kHz on a highly precise interrupt driven basis. The external crystal clock that we use for timestamping data is running with nanosecond precision. This is because unlike bench equipment the BBTK v2 allows you to replay all event data captured over periods of many minutes using its 8 MB of internal RAM. Digital oscilloscopes/logic analyzers sample at much higher rates but can only replay events over a very short period, e.g. a second or two, and across many less channels, e.g. 2 to 4 channels for a typical oscilloscope/logic analyzer. Our department would like you to come and give a talk. Would you be willing to do this? Yes. As standard we charge a daily rate plus expenses. Talks and visits typically include a grounding in the academic timing literature, a live demo of the Black Box ToolKit v2 or any of our other products, a Q & A session and an interactive forum where we can advise on your specific paradigms. Yes. We offer a service whereby we can visit onsite to test your specific equipment and paradigm. Alternatively we can test your software or hardware in our lab on calibrated computer systems and tablets. Whether we test onsite or in our own lab, either option will result in an independent timing certification report and detailed advice on how to improve your accuracy. The first step in the process is to request a formal quotation. This is valid for 30 days and prices are tied to Pounds Sterling (GBP) as we are based in the UK. We will convert prices to your local currency based on the date the quote was issued. Each quote will also include worldwide shipping and insurance as standard. If you need to discuss your requirements in more depth we will be happy to help.